When you're looking to add a new spray gun, a new hose, or a quick connect set to your existing pressure washer, they may not always fit together right. In these cases, you'll need an adapter. Whether you're searching for components that match your unit, or are searching for adapters, it's important to know what connections your unit currently has. Gas pressure washers are more universal, making it easier to match various accessories and couplings to them. However, electric pressure washers will be mostly brand specific, meaning only specific accessories or parts from the same manufacturer will be compatible. There are only three basic types of connections used on gas units: M22, 3/8" threaded, and Quick Connects. The only exception is with the gun and lance. Gun and lance components can be M22 or 1/4", so when selecting attachments, or a coupling to attach your lance to your gun, you'll need to determine whether you need M22 or 1/4". All M22 connections found on gas units will be 14mm. 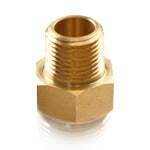 The 15mm M22 fittings are only used on select electric pressure washers. 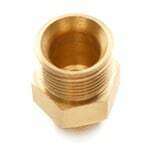 So be sure that, if you have a gas unit, you select the 14mm M22 fittings. 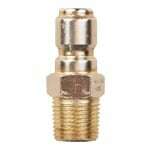 The 3/8" threaded connections may look very similar to M22 fittings, but they're not the same. The 3/8" attachments are narrower, so they won't work with the same ports or adapters. Some units will require these though, so make sure you know whether you have a 3/8" or an M22 connection. 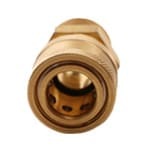 Quick Connect couplings are easier to identify, but the adapter end must be compatible with your pressure washer's M22 or 3/8" connection. They don't have threads on both ends. Quick Connect attachments are designed to snap into one another without any twisting. Keep in mind that joining two parts together requires a male fitting and a female fitting. The male attachments have threading on the outside, and the female ones have threading on the inside, so the male threads into the female. Although Quick Connect couplings don't have the threading, the male still fits inside the female. Two males or two females will not work together, so be sure you're using one of each when putting them together. The diameter of the hose itself does not indicate the fitting size required. The fitting at the end of your hose is what needs to match the fitting. 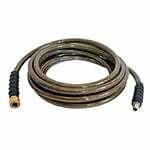 For example, A 1/4" hose simply has a 1/4" diameter to the hose but may have an M22, 3/8" threaded, or quick connect fitting at the ends. 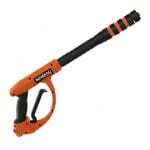 Therefore the fitting can vary despite the hose diameter. When selecting couplings, adapters, or accessories for your electric pressure washer, it's important to keep in mind that most electric pressure washers are brand specific with their attachments. Because manufacturers want their electric accessories to match just right with their pressure washers, they often design their components to be unique to their own brand. We only really see this happening in electric models. Gas models are rather universal. 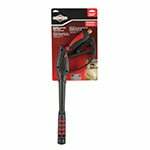 Nevertheless, if you're looking for a new spray gun, a new hose, or you're looking to incorporate Quick Connects, your best bet is to stick with the same brand, and make sure what you choose is compatible with the pressure washer model you have. While it can be possible to adapt some off-brand accessories to fit your pressure washer, it's not advisable due to pressure loss and possible leaks. At the bottoms of our product pages, we list compatible models. Always check the details on the accessory or coupling you're looking at to make sure it's a match. If we don't carry the compatible item you're looking for, you can contact the manufacturer directly for the perfect fit. 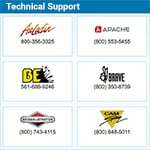 Our Pressure Washer Technical Support page lists the contact numbers for all of the manufacturers we do business with, so feel free to give them a call. If you have any questions, or would simply like to run something by me, give me a call at 1 (866) 618-9274 - I'll be happy to offer my assistance. Selecting Parts and Adapters That Fit Your Pressure Washer.. Our Power Equipment Direct how-to library can help you learn about Proposition 65 Product Labeling, Sales Tax Information and Product Recalls for Pressure Washer Equipment.